President Donald Trump signed two executive actions during a Pentagon swearing-in ceremony for Secretary of Defense James Mattis. One will "begin a great rebuilding of the armed services," while the other covered entry of foreigners into the US. "To ensure the sacrifices of our military are supported by the actions of our government," Trump said, the first executive action, titled "The rebuilding of the United States Armed Forces," called for new planes, ships and tools for the military. "As we prepare our budget request for Congress... our military strength will be questioned by no one, but neither will our dedication to peace, we do want peace," Trump said. 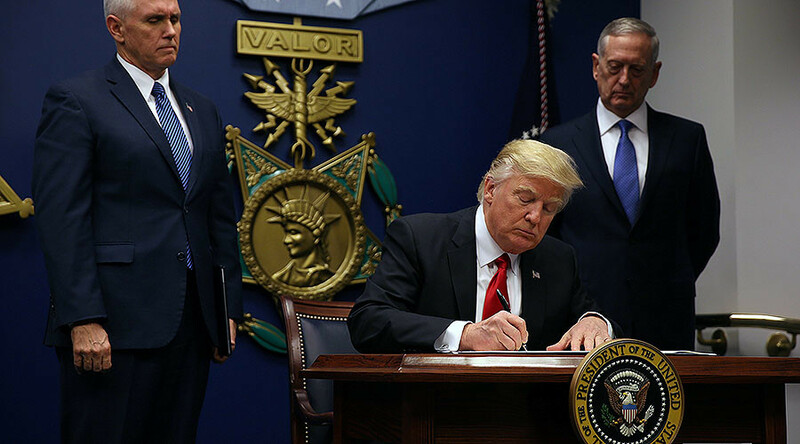 The second executive action, titled "Protection of the nation from foreign terrorist entry into the United States," adds "new vetting measures" to keep "radical Islamic terrorists" out of the US, Trump said. "We don't want 'em here." Executive actions like the ones Trump signed Friday are informal and fall under a vague category that encompasses much of what a president does when it comes to dealings with Congress or an administration. Executive orders, however, are legally binding. Representative Eliot L. Engel (D-New York) issued a response on behalf of the House Committee on Foreign Affairs, of which he is the ranking member. “This is a profoundly dark day for our country," Engel wrote. “In 1939, when Jewish refugees aboard the ship St. Louis could look ashore and see the lights of Miami, they thought the United States would be their salvation. But the power of fear and cowardice prevailed, sending those poor souls back across the ocean, many to their deaths." “Today, fear and cowardice are winning again," he added. "President Trump is slamming the door on the world's most desperate refugees, whose eyes are gazing upon our shores today, seeking the promise of America that has illuminated the world for more than two centuries." Trump's appearance at the Pentagon's Hall of Heroes was a marked difference from his remarks at the CIA memorial for fallen agents on Saturday. The president mostly read from prepared remarks and did not veer away from the topics at hand. Draft version of the actions were circulated by the media on Friday morning. It has not been confirmed if the language in them matches what the president signed because neither have been released yet. According to an executive action draft obtained by the Washington Post, Mattis will be charged with coming up with a 30-day "readiness review" to determine changes needed in "manning, training, equipping, maintenance, munitions and infrastructure."